The Cuban government has blocked an online newspaper launched by well-known dissident blogger Yoani Sanchez, hours after it went live. 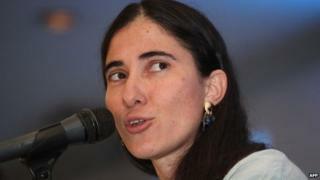 Web users in Cuba are being diverted to another website, which accuses Ms Sanchez of having hidden political interests. Ms Sanchez said her website, called 14ymedio, would provide daily news about the communist-run country. She insisted it would not be a platform against the government. But web users in Cuba reported that they were being diverted to a website calling itself "yoani$landia", which accuses Ms Sanchez of being "obsessed with money". "This website is from a group of people who had enough of seeing Yoani Sanchez presenting herself as the Mother Teresa of Calcutta of Cuban dissidents," says an article on the site. It adds that Ms Sanchez is "probably the richest Cuban on the island" and is funded by Spanish and Brazilian media outfits. The editors of yoani$landia do not identify themselves, but they are believed to be Cuban government officials. Cuban media, including the country's three national newspapers, are under strict state control. But President Raul Castro has eased restrictions on dissidents in recent years, allowing opponents of the government - including Sanchez - to travel abroad. In her blog published in the online paper's first edition, Sanchez says 14ymedio has been an obsession for her for more than four years. She says she wants the paper to "contribute information so that Cubans can decide with more maturity their own destinies". Its first edition also features a report from a Havana hospital, describing the work of nurses and other staff on night duty and the victims of violence they attend to. It also showcases a lengthy interview with jailed opposition writer Angel Santiesteban. But not all its contents is of a political nature. There is also advice on how to deal with dry or damaged hair and a sports feature on why Cuban football is getting less coverage and state backing than baseball. Sanchez achieved international recognition with her prize-winning blog Generation Y, in which she criticised the restrictions on freedom of speech and movement imposed on the island since the 1959 revolution.